Islam is the second largest religion in Ethiopia with over 33.9% of the population practicing it in 2007. The faith arrived in Ethiopia at an early date, shortly before the hijira. Islam is the religion of the overwhelming majority of the Somali, Afar, Argobba, Harari, Berta, Alaba, and Silt'e and also has many adherents among the Gurage and the Oromo, the largest ethnic group in Ethiopia, as well as a minority of Amhara, the second largest ethnic group in the country. Muslims arrived in the Axumite Empire during the Hijarat as early disciples from Mecca, persecuted by the ruling Quraysh tribe. They were received by the Christian ruler of Axum, whom Arabic tradition has named Ashama ibn Abjar (King Armah in Ge'Ez and Amharic), and he settled them in Negash. Located in the Tigray Region. On the other hand, the principal center of Islamic culture, learning, and propagation has been Wello. The Quraysh sent emissaries to bring them back to Arabia, but the King of Axum refused their demands. The Prophet himself instructed his followers who came to the Axumite empire, to respect and protect Axum as well as live in peace with the native Christians. While the city of Medina, north of Mecca, ultimately became the new home of most of the exiles from Mecca, a 7th-century cemetery excavated inside the boundaries of Negash shows the Muslim community survived their departure. A traditional home in Harar with a niche adorned with Islamic calligraphy. Islam developed more rapidly in the eastern part of the Horn region, particularly among the Somali and Harari. This was challenged by the mostly Christian northern people of Abyssinia, including Amhara, Tigray and north western Oromo. However the north and northeastern expansion of the Oromo, who practiced mainstream traditional Waaqa, affected the growth of Islam in its early days. Historian Ulrich Braukamper says, "the expansion of the non-Muslim Oromo people during subsequent centuries mostly eliminated Islam in those areas." However, following the centralization of some Oromo communities, some of them adopted Islam and today constitutes over 68% of their population. In the 16th century, Muslims from the Adal Sultanate embarked on a Conquest of Abyssinia (Futuh al-Habash) under the command of Ahmad ibn Ibrahim al-Ghazi (referred to as Gragn Mohammed or "Mohammed the left-handed" in Amharic). Under the former Emperor Haile Selassie, Muslim communities could bring matters of personal and family law and inheritance before Islamic courts; many did so and probably continued to do so under the revolutionary regime. However, many Muslims dealt with such matters in terms of customary law. For example, the Somali and other pastoralists tended not to follow the requirement that daughters inherit half as much property as sons, particularly when livestock was at issue. In parts of Eritrea, the tendency to treat land as the corporate property of a descent group (lineage or clan) precluded following the Islamic principle of division of property among one's heirs. When Mohammed saw the persecution to which his followers were subjected to in Mecca, he told them to find safe haven in northern Ethiopia, Abyssinia, where they would "find a king there who does not wrong anyone." It was the first hijra (migration) in Islam history. Ethiopia is home to Harar. According to UNESCO, it is regarded as the fourth holy city of Islam. It has 82 mosques, three of which date from the 10th century, as well as 102 shrines. 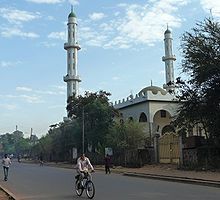 A mosque in Bahir Dar. Much as the rest of the Muslim world, the beliefs and practices of the Muslims in Ethiopia are basically the same: embodied in the Qur'an and the Sunnah. There are also Sufi brotherhoods present in Ethiopia such as the Qadiriyyah order in Wello. The most important Islamic religious practices, such as the daily ritual prayers (Salat) and fasting (Arabic صوم, Sawm, Ethiopic ጾም, S.om or Tsom - used by Christians during their holy days as well) during the holy month of Ramadan, are observed both in urban centers as well as in rural areas, among both settled peoples and nomads. Numerous Muslims in Ethiopia perform the pilgrimage to Mecca every year. In Ethiopia's Muslim communities, as in neighboring Sudan and Somalia, many of the faithful are associated with, but not necessarily members of any specific Sufi order. Nevertheless, formal and informal attachment to Sufi practices is widespread. The emphasis seems less on the contemplative and disciplined mysticism, and more on the concentration of the spiritual powers possessed by certain founders of the orders and the leaders of local branches. ^ Ofcansky, Thomas P.; LaVerle Berry (1991). "Ethiopia and the Early Islamic Period". A Country Study: Ethiopia. Federal Research Division, Library of Congress. Retrieved 2007-09-25. According to Islamic tradition, some members of Muhammad's family and some of his early converts had taken refuge with the Aksumites during the troubled years preceding the Prophet's rise to power, and Aksum was exempted from the jihad, or holy war, as a result. ^ Paul B. Henze, Layers of Time: A History of Ethiopia (New York: Palgrave, 2000), p. 43. Dickson, David, "Political Islam in Sub-Saharan Africa: The Need for a new Research and Diplomatic Agenda", United States Institute of Peace, Special Report 140, May 2005.